You landed on my screen door to get photographed and drawn, didn’t you? 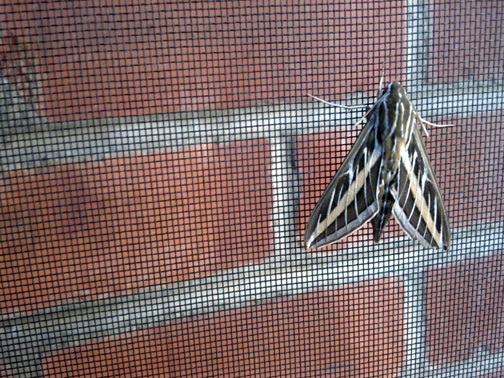 I ask the striking creature / bug / moth that clings to my screen door one early morning, last week. It’s there all day and doesn’t seem bothered while we enter and exit. First thing the following day, I go to the door and sadly – it’s gone. Liz, a friend who lives in California, sends a text – Is this the same kind of moth you had on your door yesterday? Did my moth fly to California overnight to visit Liz? One can think that with the photo that is attached. I learn (via Facebook where I’d posted the photo) it’s a Hawk Moth. It flies like a hummingbird, Dave writes. Donna comments it’s a White Lined Sphinx Moth an important pollinator, especially of my neighbors Sacred Datura. Nature is amazing, says Nancy. And as though reading my mind Dominique notes … as your reputation spreads among the arthropods you will surely encounter more six-legged friends. Just keep the screen doors deployed. And it’s unanimous – Yes! It arrived to be drawn. After more reading : I conclude the reason it left at night is because it’s nocturnal and if it did go to California, it did so because it can go without eating for long periods of time. Here is the Hawk Moth. The questions at the start: Do I focus on the external design of the moth? Do I try to include internal anatomy? I do a bit of both. I include its larvae (and anatomy) which is medium to large with a stout body. 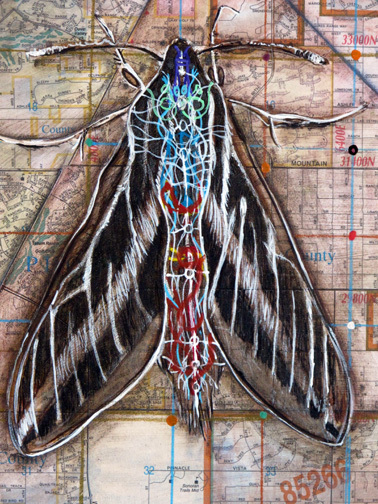 When complete the organs I include make it appear like some sort of wired, electrical moth. I’ll leave the wings as they are – dark, dense and lined. And furry – the moth appears to have hair – but in fact it has scales and they keep it warm as it flies at night. I talk to Robin, a neighbor, and I tell her about the great moth at my door. She looks horrified. I guess some people find them creepy. I don’t. Though I learn something that I’ll keep from her – some Hawk Moths can have a tongue as long as 14 inches. Not this one, I’m sure. …one more composition for the bug exhibit. 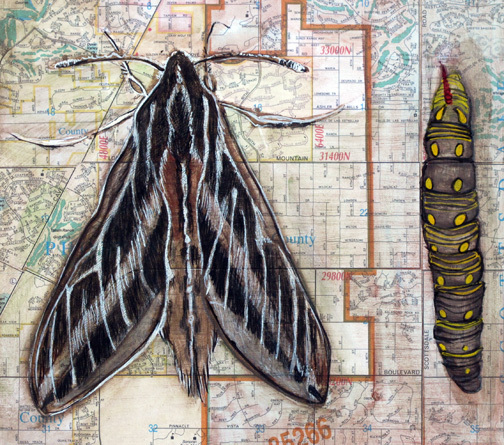 This entry was posted in anatomy, art and tagged anatomy study, art, bugs, casein, collage, hawk moth, idea museum, jeepers creepers exhibition by monica. Bookmark the permalink. And it was at eye level – all day – camera ready if you ask me.